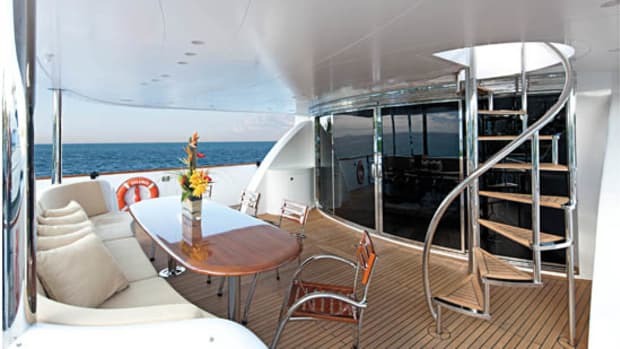 Tasting the best of the Caribbean aboard the 164-footer JeMaSa. 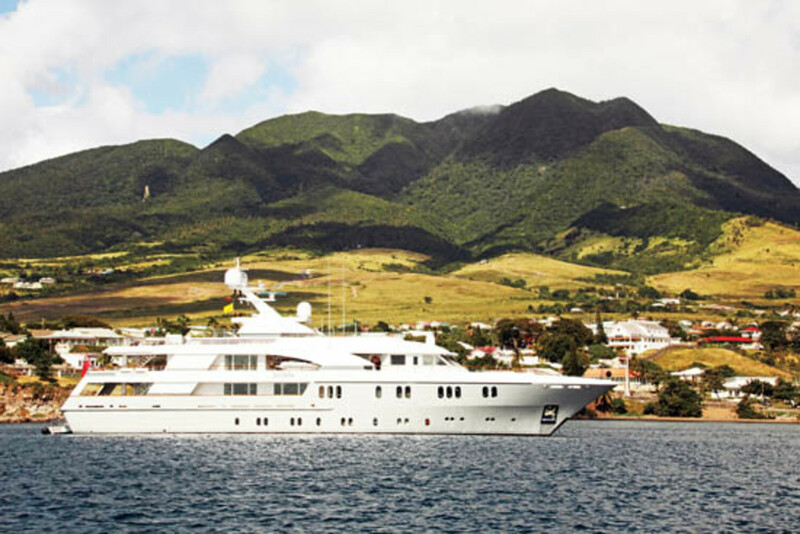 JeMaSa at anchor with the lush landscape of St. Kitts’ countryside providing a perfect backdrop. There are no Jetways at the Antigua airport. As soon as the doors of my plane opened, I plunged directly into the warm Caribbean air. A man sang greetings, and a woman distributed plastic cups of chilled pink juice. And I wasn’t even through customs yet. And I certainly wasn’t yet aboard the 164-foot JeMaSa, which I was meeting at Nelson’s Dockyard following the Antigua Charter Show. Shortly after my arrival, the yachts blew their horns signifying that the show was officially over. 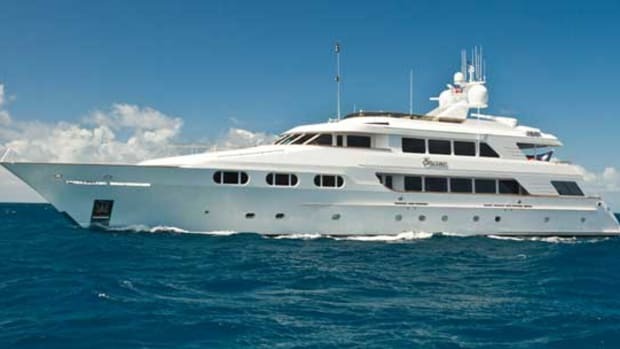 I could almost feel the crews exhale with the horns as they brought coolers out onto the docks and the charter brokers sipped ros wine on a beach that was accessible only by dinghy. The next morning, we were off. Well, we’d be off as soon as the divers untangled our forward anchor chain and JeMaSa could be maneuvered out of a tiny, narrow harbor littered with small sailboats and trawlers sitting on the hook. Just getting out of our slip was a challenge—there was but a few feet of clearance on either side. When I asked Capt. Juan Koegelenberg about the tight squeeze, he replied, “It’s when there’s under a foot on either side—then you have to be careful.” It was a sight to see though—a megayacht inching her way out of a slip and the crews of the sailboats flanking us lined up at their bowrails to watch. The chief stewardess had warned of rough seas during our 2 1/2 -hour passage to Barbuda but I found the rocking of the boat to be more soothing than upsetting and soon dozed off in the cross breezes of the main aft deck. When we’d finally anchored off the island, the crew immediately set to work bringing supplies to the shore for that night’s beach barbecue. Grills. Tents. Tables. Chairs. Beef. Chicken. Tomatoes. Wine. Gin. Vodka. Every item had to be packed and loaded into the tenders. The only sight interrupting my view of the blue Caribbean was the white beach stretched off our starboard side. We wouldn’t see another boat until the following afternoon when a small sailboat would cruise past. Once everything was in place, tiki torches lit a path up the sand to the pop-up four-star restaurant on the beach. The only footprints to be seen were from the crew, and the only debris washed up was broken conch shells. Chef Michael Mondor had three Webers blazing away as the sun set. One was dedicated to vegetables: roasted tomatoes and potatoes and grilled asparagus and onions for a salad. The other two were grilling the meat: lime-and-ginger chicken; lamb with a rosemary, mint, and balsamic reduction; peppered beef; and tarragon and French mustard shrimp. After dinner it was back to JeMaSa where I grabbed a beer and curled up in the seating area on the bow under a thick blanket to keep the dew off. With no other boats or lights around, nothing obscured the stars. I’ve never been one of the lucky ones to spot shooting stars, but that night I saw at least five streak across the sky. Though that tempted me to spend the night outside, I decided that I needed to be fully rested for tomorrow’s full day of playing with JeMaSa’s watertoys. In the morning, the crew had begun launching toys from the tender garage by the time I made it outside. Each was attached to a line, creating a to-do list of the awesome. The Banana connected to the Buzz Bomb, and the Buzz Bomb connected to the PWCs, and the PWCs connected to the kayaks. (These are just the floating toys and don’t include the scuba and snorkeling gear, the water skis, or the three tenders that make JeMaSa ideal for the active and adventurous.) But the pice de rsistance—the jewel in the crown of watertoys—was the inflatable waterslide that unfurled from the sundeck. A confession: I hate heights. My palms sweat at the thought of having to use a stepladder. And yet there I was, standing on the sundeck and peering over the edge. My chest was tightening, but my brain somehow said, “Go!” So I sat at the top as First Mate James Cutting held the hose and pushed me away. I veered toward the left edge of the slide and hit the Caribbean with a shot of saltwater up my nose. I surfaced sputtering and gasping for air with one thought—to go again. I took a few more rounds down the slide before refueling with peppered scallops in a ginger-lemongrass sauce then spent the afternoon being towed on (and bounced off) the inflatable toys. The activity of the day was in stark contrast to the calm of the night. The crew set up the TV on the forward bow, popped some popcorn, and brought out drinks for a screening of Goodfellas. It was way better than any cinema, with the only light coming from the thousands of stars above. former sugar mills, or Carib Brewery tours (by appointment only). On St. Kitts there’s an equal ratio of monkeys and people, but on Nevis, the monkeys outnumber the humans. By virtue of being smaller, Nevis is more exclusive, and it’s where the Four Seasons and Nesbit Plantation, my dinner destination, offer full-service resorts. It was there I dined on just-pink duck with Asian noodles. A new day meant a new island—St. Barths. 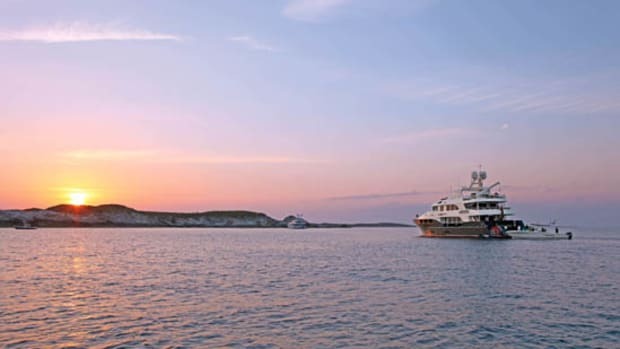 It’s the preferred vacation destination of the rich and famous and home to megayacht-owner Roman Abramovich’s celebrity-studded New Year’s Eve party (though party seems to be an understatement as it spans his home and yachts and features musical performances by the world’s top performers). Yachts were claiming their berths in Gustavia Harbor for the celebrations in a couple of weeks as the harbormaster doesn’t take reservations, but we were fortunate enough to get a spot. 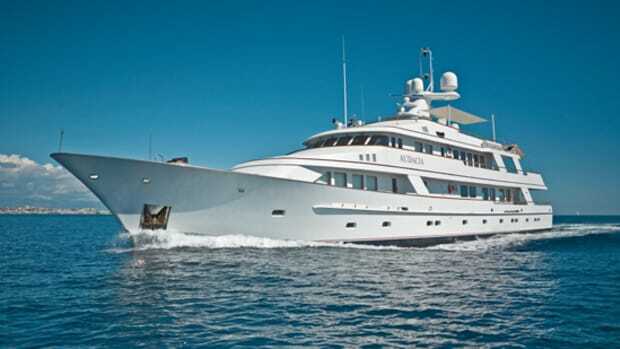 Restaurants and high-end retailers surround the harbor as if it were Fifth Avenue, and just outside, recognizable yachts such as Luna (owned by Abramovich) were anchored. Another car tour showed us the homes of residents like Steve Martin and their favorite hangouts like the Eden Rock. And then suddenly it was the last day. With my flight out of St. Martin in the afternoon, Capt. Koegelenberg was determined to make the morning bridge opening. The width of the St. Martin bridge is 55 feet; JeMaSa has a 32-foot beam. After we cleared it and docked, there was time for lunch at the Sunset Grill, located at the end of the St. Martin airport runway. Danger signs warning of “extreme bodily harm and/or death” didn’t deter passers-by from gawking as planes seemed to descend onto their heads. Shortly after finishing the last drops of the trip’s last Carib, it was time for me to head to the airport to board a plane that would take off over the heads of the risktakers and fools who dared to stand beneath the path of a jet at full power.